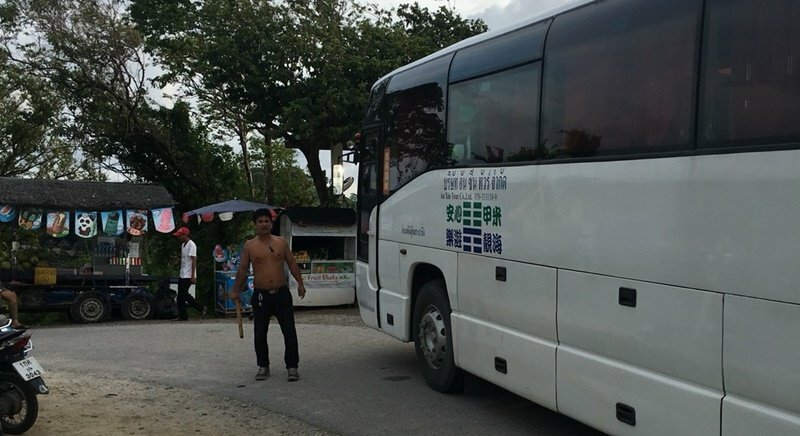 PHUKET: It has been confirmed that the driver of an An Xin Tour Co Ltd bus who was found to be under the influence of crystal meth (ya ice) after he had a dispute with security at the Windmill Viewpoint on Friday is to have his driver’s licence revoked. Chalong police arrested the then unnamed tour bus driver who freaked out at Phuket's iconic Windmill viewpoint on Cape Promthep on Friday. Speaking to The Phuket News today (Oct 30), Mr Prapai Suangkul, Head of the Academic Department of the Phuket Provincial Land Office (PLTO), said, “After seeing the footage of this man’s behaviour and the risk and damage he has caused, I can confirm that the his commercial driver’s licence will be revoked by the Transport Office. “Tomorrow I will talk with his employer, An Xin Tour Co Ltd, and get the required documents from them which are needed to get the licence revoked,” Mr Prapai said.